I’ve gotten a few questions about some things people have spotted on Interstate – namely “signals” that don’t match anything I’ve described in my signal series. That’s because those aren’t signals in the same sense of the word that the ABS or pre-empt or combination signals are. Those are called summary switch indicators or advanced switch indicators, and then I figured a post or two on switches first would be helpful to explain what those are. 1. A switch can be set to normal or diverging – normal to continue straight; diverging to move the train to (or from) another track. 2. The part of the switch that moves and that generally matters the most to operators are called the switch points. When a train goes over a switch and the points are facing the train (which gives you the choice of diverging or not), that’s called a facing move. When a train goes over a switch and the points are facing away from the train, that’s called a trailing move. 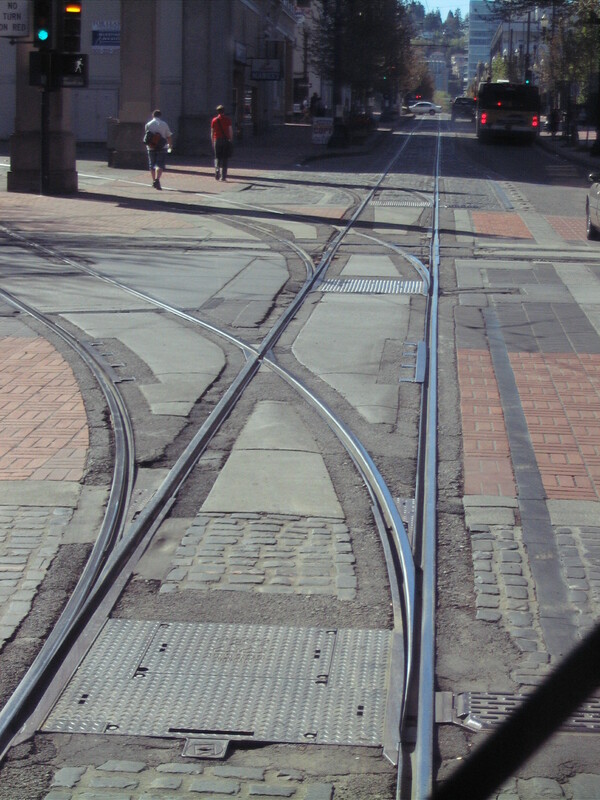 T-rail makes up the majority of the alignment. Switches in t-rail have indicators associated with them (the appearance of which will vary depending on the type of switch it is) that will display green if the switch is set for a normal route and yellow if it is set to diverge. These are manual switches on Burnside set to normal. Note the green targets on top of the switch machines – this shows that the switches are set normal, which you can verify by observing the points of the switch ahead. Throwing the switch to diverging rotates those targets to display yellow. 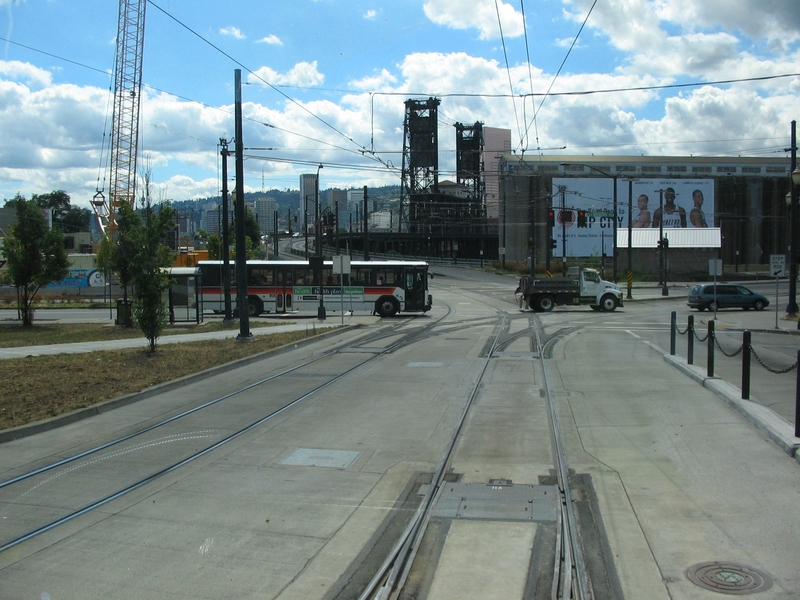 This is a trailing move for us – the points of the switch are facing away from the train and there’s no way we can get on the diverging track from this direction (we’d have to go past the switch points, get out, walk to the other cab, and run eastbound in the westbound track to diverge) Also visible is a speed limit sign, and a decision point marker, as well as the C & P signs, but you already know what those are. Remember this picture that I used a while back to show the diverging route on the ABS signal at the Elmonica platform? Now look down the track a short distance, and you can see the yellow switch indicator lights showing that the switches have been thrown to diverging. This train is going to diverge off of the mainline into the Elmo yard. Girder rail is the pavement embedded rail that is found downtown, along Holladay, and along Washington in Hillsboro. This type of rail is shallower than t-rail and is prone to getting filled with debris (like in the fall when city maintenance people blow dead leaves into the right of way…) and so it is only used in lower-speed areas. In this picture, we’ve just left the Rose Quarter platform (I think this was a Blue Line train) and we’re moving over one girder rail switch as a trailing move, and there’s another up ahead which is a facing move. This is how trains can switch to the Interstate alignment as well as the special events track in the Rose Quarter platform. 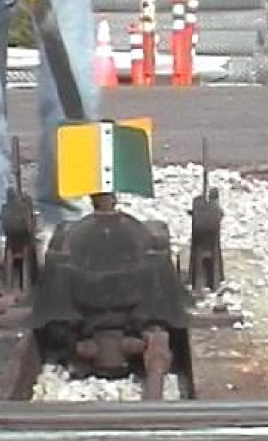 Notice that girder rail switches have no green or yellow indicators to show how they are set. Power switches are all of the switches that can be thrown from the cab of a train with the Vetag. For a refresher on how it works, revisit my post on call loops – a train stops with the transponder over the call loop which allows the operator to remotely throw the switch. 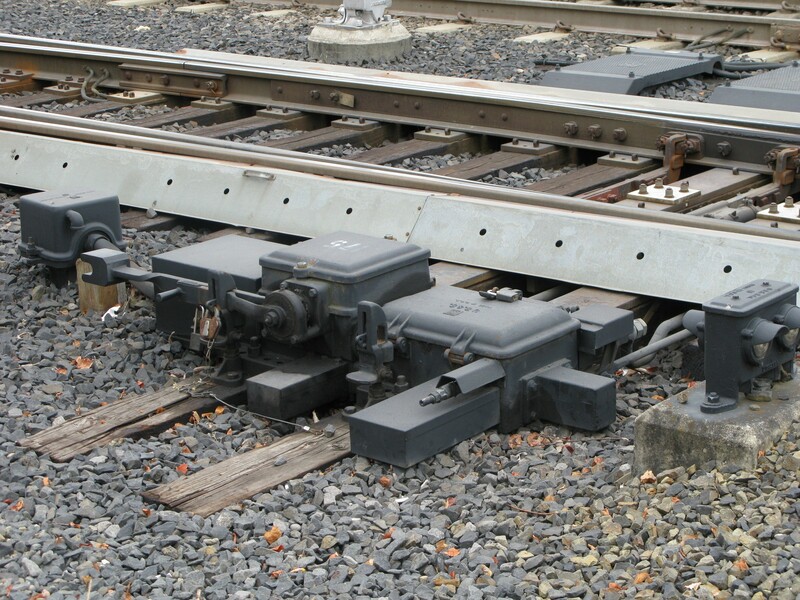 Power switches can also be operated manually if necessary, and so for safety reasons all t-rail power switches on the mainline are padlocked as you can see in the above picture. Manual switches (in both t-rail and girder rail) cannot be thrown remotely via the Vetag and must be thrown by hand. So switches that are frequently used on the mainline are more likely to be power switches, because those can be thrown much faster than a manual switch. 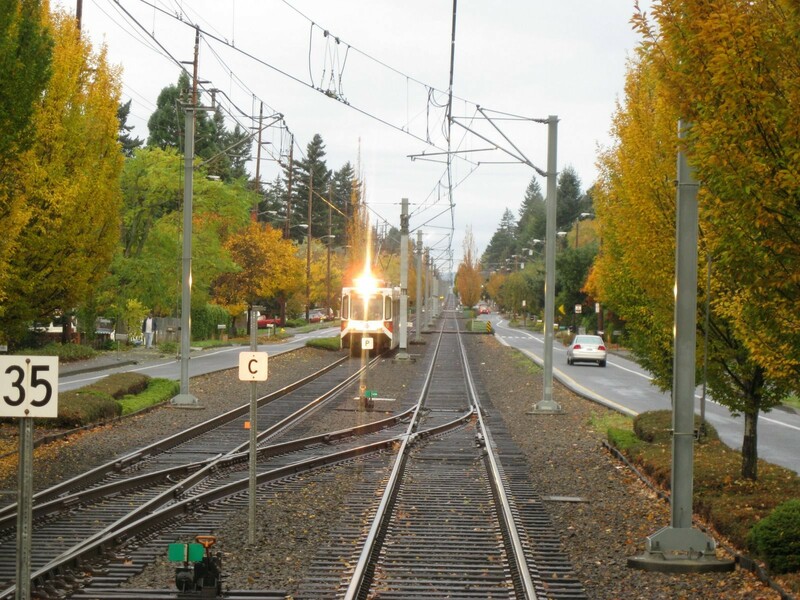 In girder rail, power switches and manual switches look the same – the above picture shows two power switches and a manual switch which are used to get a train into the 11th Avenue terminus. Do not, under any circumstances, try to throw a switch, touch a switch, attempt to remove the padlocks, etc. Aside from that being a stupid thing to do because of the risk of getting hit by a train, there’s probably some sort of criminal offense involved in tampering with anything that could potentially derail a train. Does it get more complicated than this? Of course! More in the next post. 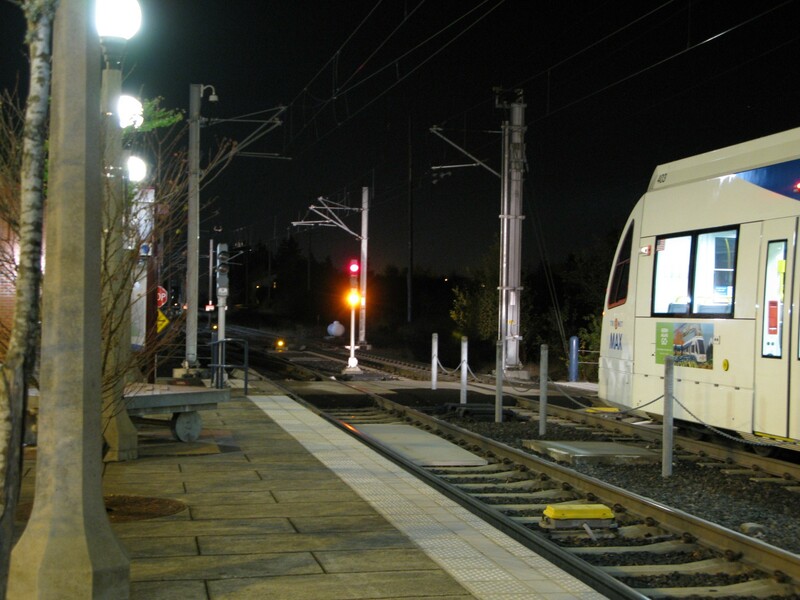 This entry was posted in alignment, safety, switches and tagged abs, abs signals, light rail, max train, portland, public transit, public transportation, rail, railroad, safety, switches, trains, trimet. Bookmark the permalink.